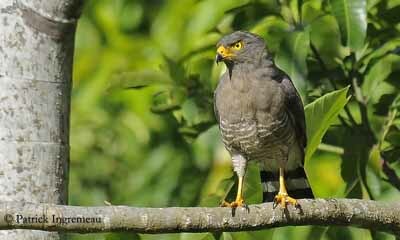 The Roadside Hawk is a South American species, very common within its range. 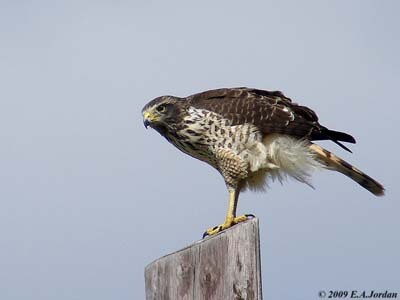 This hawk is often seen perched on the roadside or along tracks, often fairly low, giving the birds its English name. 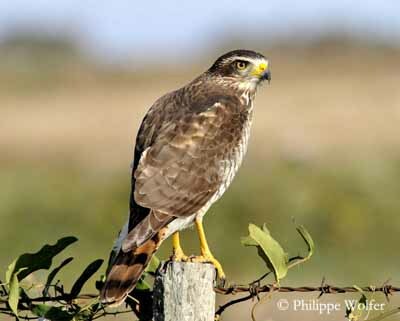 This hawk is fairly small with longer tail and shorter wings than the other members of the genus Buteo. 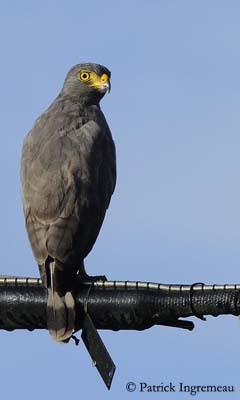 The head, upperparts, chin and throat are brownish-grey to pale grey. On the underparts, breast, belly and vent are heavily barred cinnamon and white. 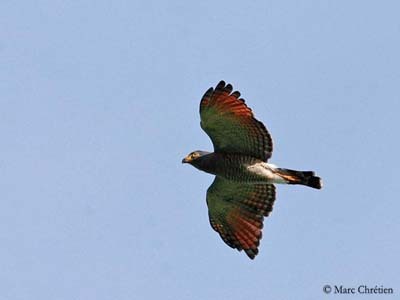 The wings show bright chestnut patch at base of the primary flight feathers, very conspicuous in flight. The tail is grey to rufous with 4-5 broad black bands and white tip. The head is grey to greyish-brown. The hooked bill is blackish with orange to yellow cere. The eyes are yellow to orange-red. Legs and feet are dull orange to bright yellow. The thighs are feathered whitish and finely barred rufous. The female has similar appearance but she is larger than the male. The immature has white or brownish streaks on neck and upper back. The underparts are white to buff with streaked breast and barred brown belly. We can find 12 subspecies throughout the wide range. They vary in size and colour. The largest birds occur in the southern parts of the range. 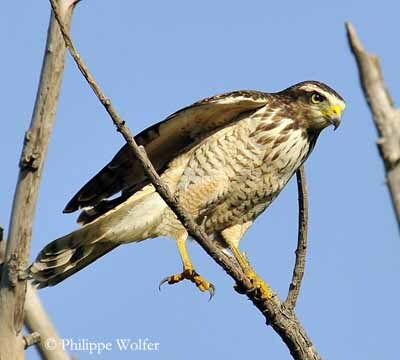 The Roadside Hawk’s common call is a drawn-out scream, usually uttered from a perch “rreeeaew” or “meeeahhh”. During the aerial displays, it gives a persistent, rapid, nasal series of laughing or barking notes “heh-heh-heh…” or “reh, reh, heh-heh-heh”. 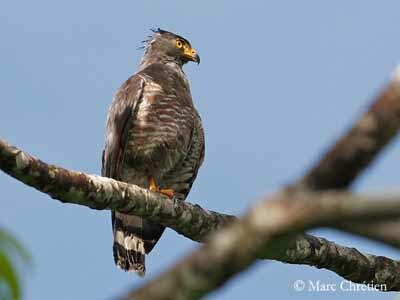 The Roadside Hawk is common in lowlands in tropical and subtropical habitats, but it avoids the primary forest, the densely wooded patches, the deserts and the open plains. 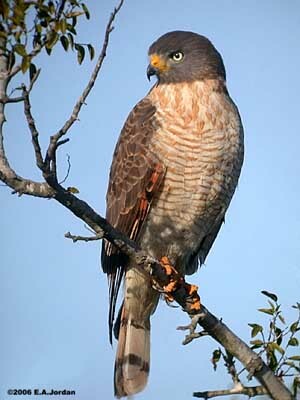 This hawk is often seen at forest edge or in open woodlands, in savannah with forest gallery and in forested patches. This species can enter the large cities with trees in Brazil. It can occur up to 2500 metres of elevation in Colombia. 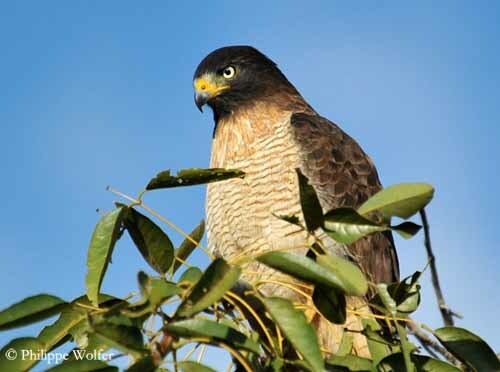 The Roadside Hawk has wide range, from Mexico and Central America, to South America, Ecuador, Colombia, Venezuela, the Guyanas, Brazil, Bolivia, Paraguay, Uruguay and northern Argentina. This species seems to be sedentary within its range. 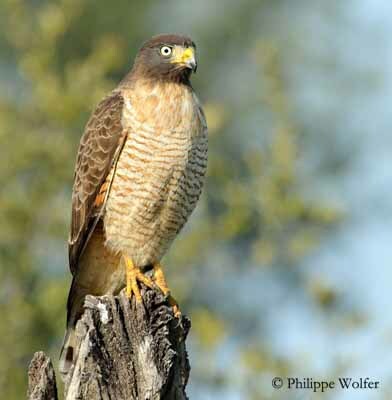 The Roadside Hawk feeds mainly on insects, reptiles and small mammals. It hunts from an exposed perch, waiting for preys, and once the victim is detected, it swoops down onto it. It also hunts along the line of the savannah fires where it catches all kinds of small animals flushed by the fire. It often hunts close to the fire and sometimes, it slightly burns its plumage. 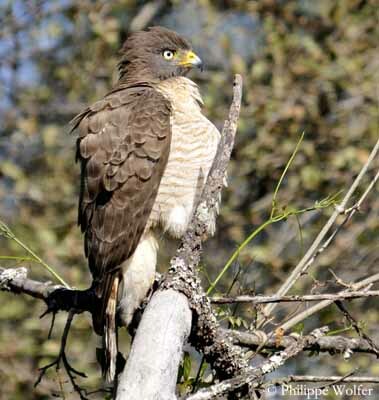 The Roadside Hawk can be seen alone or in pairs. It usually perches on fences, pylons and trees on the roadside. During the breeding season, it becomes very vocal at the nest-site. 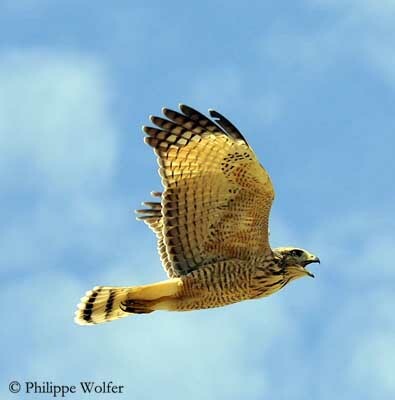 Aerial displays are accompanied by persistent and rapid barking calls. The adults are very aggressive during this period towards intruders and predators. They can attack and strike an intruder, even a human. Besides the nest-defence, courtship displays occur above the nest-site with flight displays performed by both mates, and the male also performs courtship feeding to the female. 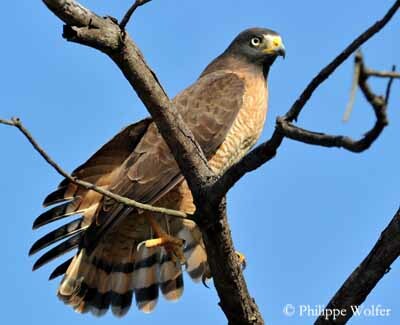 The Roadside Hawk flies weakly and usually over short distances. It performs rapid, stiff wing beats interspersed with brief glides. Except during the flight displays, the wings are flattened or slightly arched, the tail is closed or slightly spread. The breeding season varies throughout the range, but usually occurs from the late dry season and during the rainy season, according to the region. 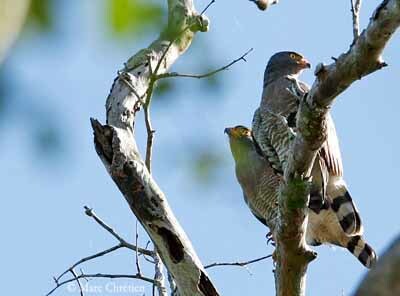 The Roadside Hawk nests in trees. The nest is placed near the treetop. That is a bulky structure made with sticks and lined with leaves, of about 20-45 cm wide and up to 35 cm deep. The nest is well concealed among the foliage. The female lays 1-2 whitish eggs with brown markings. The incubation lasts 35-37 days. A replacement clutch is laid after failed attempt. The male feeds the female during this period. The young are fed by both parents. 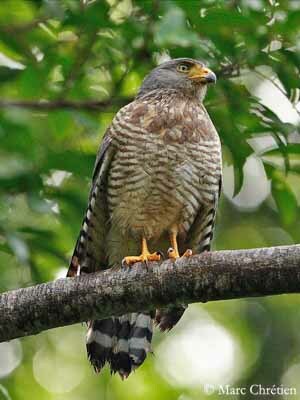 The Roadside Hawk feeds on insects, mainly Orthopterans. It also takes amphibians, lizards, snakes, fish and rodents. 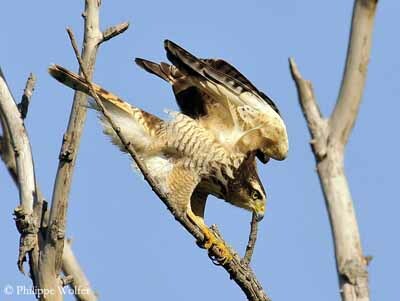 The prey items vary with the range and the season, but this hawk always hunts from perch and along the line of the savannah fires. 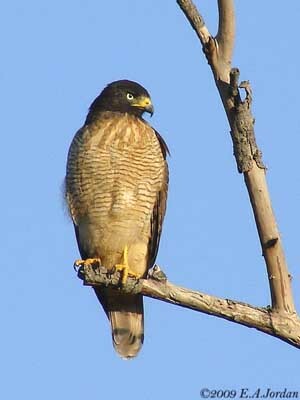 The Roadside Hawk is common and widespread within its range. It can occur in large cities in Brazil and French Guyana. This species is not threatened at this moment, and evaluated as Least Concern.